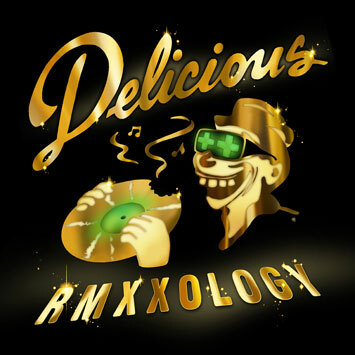 Go back to the future with Delicious Vinyl RMXXOLOGY, an all-new 15-track album featuring classic tracks by Young MC, The Pharcyde, Masta Ace, The Brand New Heavies, and Fatlip re-imagined by artists including Peaches, Hot Chip, and Eminem. The first two singles from the album are already embedded in the hearts and minds of DJs and party people worldwide: pioneering electro goddess Peaches' sizzling update of Tone Loc's immortal "Wild Thing" and Aaron LaCrate and Debonair Samir's gutter-bumping Baltimore blast of Young MC's "Know How." RMXXOLOGY was born a year ago when DV honcho Rick Ross met Peaches after a show. After agreeing that she would do a version of Tone Loc's "Wild Thing", they began brainstorming a dream team of artists to let loose on the DV catalog. This led to the creation of The Delicious Vinyl All-Stars, a collective including prime-time players like Eminem and Diplo, as well as upstart French freakers Mr. Flash, Breakbot, and Don Rimini, and L.A. new jacks Cory Nitta (Pink Enemy/Philippians) and Bobby Evans (Brother eade). Soon each of the DV All-Stars was having their way with a Delicious Vinyl classic of their choosing. As Rick Ross puts it, "Peaches is my co-curator on RMXXOLOGY. We reached out to people who know how to have fun exploring their influences and adding their own magic to something they love. That's the creative core of what the RMXXOLOGY project is about: start with these dope raw materials and reassemble them into something new and fun, revitalizing the music for a new generation of fans!" The album runs the gamut from Pink Enemy's tech-soul take on The Brand New Heavies' beloved "Never Stop" to Eminem's head-knock redux of Masta Ace "Slaughterhouse" and, the real stunner, Hot Chip's transformation of The Pharcyde's "Passin' Me By" into a sacred hymn. Rick Ross explains: "RMXXOLOGY represents a whole variety of styles. It's all about creating alternative versions of these classics, rather than remixing them expressly for the dancefloor. After all, the original songs always brought people to the dancefloor anyway!" But don't fear, The dancefloor ain't being neglected. The third single from RMXXOLOGY, "Bust A Move" RMXXS, finds Diplo and Don Rimini manhandling the Young MC classic into club-savvy form. And then there's the album's lead track, Bobby Evans' "Freak-A-Zoid Robots (RMXXOLOGY Theme)", an homage to Afrika Bambaataa and old school electro that embodies the album's past-is-present spirit. Featuring gold sparkle artwork that flips the classic Delicious Vinyl logo in the same way that The Delicious Vinyl All-Stars have re-thunk the original music, RMXXOLOGY is destined to be this summer's hottest album. Various - We Love Afrobeat!